In the previous post, Loading Topo Maps On A Garmin GPS for the CDT, I explained how to load topo maps onto a Garmin GPS for the CDT. I realize not all who hike the CDT take a GPS, but it is common, so this is for those who do. Now that you have maps, you need the waypoints and tracks. All my information was compiled from these three wonderful sources which have a ton to read if you are looking for details…I have basically combined them all and given the cliff notes below…click on them to go directly to the sites. These are the waypoints hikers use if they are using some type of GPS. They include the major alternates, but not all the tiny ones Ley can have. Some carry these paper maps, but my understanding is that many find the waypoints useful and once they are on trail, they find themselves preferring the Jonathan Ley paper maps, which also contain pros/cons for alternates. It’s a matter of personal preference and how much info you like to carry. The most commonly carried maps on the CDT. Yogi now offers to print them out for you and J Ley now offers them in digital download. Email J Ley for the link. His website is not updated, but he hopes to get time to update it and the maps ARE updated yearly! Maps are usually updated by February each year. He does this free of charge so be sure to DONATE for all his efforts. Guthook’s hiking apps ROCK! If you use a smarphone, it’s great to have, but I caution against using it in place of a GPS unless you have a magical way to keep that phone charged or have strong map & compass skills and plan to use it infrequently. It’s a matter of personal preference and where your comfort level lies with navigation. Since 2013 Beacon has created a data book for the “official route”(not including alternates) using Al H’s 2012 Data Book, Bear Creek waypoints, Ley maps, Wolf maps, and pretty much anything CDT. An extremely helpful and detailed spreadsheet that lists the waypoints, cumulative mileage, water sources, elevations…you get it…a DATA BOOK. Amazing resource! Thank you Beacon! Here is the link to Beacon’s 2016 Data Book. I have reluctantly added a GPS for my CDT hike. I used the GPS on my iPhone for the PCT, but I’ve heard I will use it more on the CDT, so I want to be safe and have both if needed. I think you could get away with just the Smartphone (or no GPS at all), but I use my battery so much for blogging (and tv watching) that I want to have a back up. 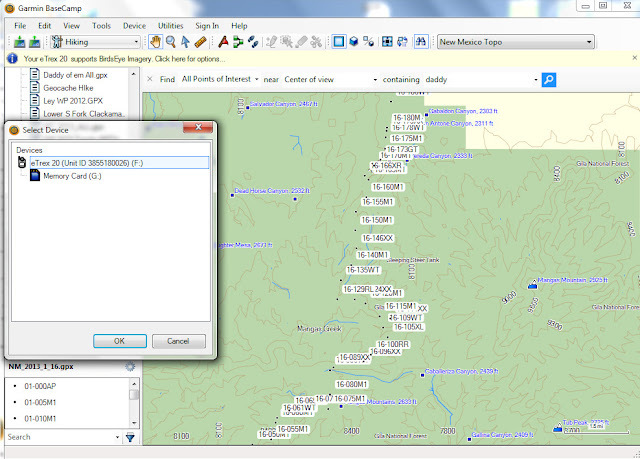 **Bear Creek now offers the waypoints in POI format on their page so no need to spend time converting them! The main decision here is to choose if you want to use waypoints or points of interest (POIs). There are currently over 7000 waypoints for the trail. They will not all fit on the memory and/or sd card of a GPS. To solve this problem, some choose to make the waypoints POIs. The advantage is that the points all fit on the GPS with no mid-hike loading needed. The disadvantage is that the labels of the waypoint on POIs are only visible if you manually select the waypoint. I chose to make mine POIs since I want less on trail GPS maintenance and I will not be using the GPS as my main daily guide. Jerry Brown’s POI file w/CDT icons. Loading POIs are a bit different. You have two options with POIs. Jerry Brown has kindly created a single POI file on his site that contains all of the CDT waypoints (as POIs). The only problem is that he used an icon of the CDT as the marker for each POI. I found that the icons covered too much of the map, so I chose to do the added step of converting the original waypoints to POIs using Garmin POI Loader. It is a quick and simple download that converts the waypoints to POIs and loads them onto your GPS in one simple step. You then get waypoints that look like my picture above with dots as POIs instead of CDT icons. Two helpful hints: Be sure to UNZIP the file before conversion. You will notice the waypoints are given in sections and completely for the whole state. Thru hikers will just load the whole state file. **Once you have loaded the POIs onto a Garmin, they WILL NOT be in your “POI” folder when you view your Garmin. You can find them in your “Extras” folder by holding down the Main Menu button for a couple seconds. **If you are having trouble viewing all the POIs on the map once loaded, you may need to change your zoom settings. Setup Map–>Advanced Map Setup–>Zoom Levels–>User Waypoints–>Change Auto to 500mi. StarMan used to post a track file, but now with Bear Creek’s updates and Guthook, you have all you need! Congratulations hikers! The hard part is over (this has gotten so much easier in the last couple years! ), now you just need to hike it! What is the surgery for? Anything affecting the hike?